Description: With a brief moment of sleet, 17G rolls west. Description: The locomotive for the transfer to the Elkhart & Western sits waiting for use. Description: A light 3-unit NS consist - led by ex-CR GP38-2 #5336 - prepares to enter Pine Yard off of the NS mainline at Pine Junction. Description: Even though it has been 9 years since the break up of Conrail, their paint schemes still roam the rails. But how long will that last? Description: This time stopped on the EC/Hammond border. Description: The hot metal train headed thru Dolton during a spring downpour. Description: Hot metal train arrives. Description: NS L-42 heads south with a ex Conrail GP-38-2 heading up there train bound for Indianapolis. Description: NS L-42 heads south at MP-81 on the Marion Branch bound for Hawthorn Yards in Indianapolis. Description: NS 5106 (EX-Southern #5106A) at NS Botsford Yard. 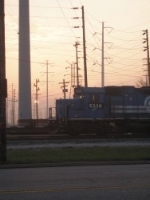 Description: A Conrail GP38-2 idles in front of the yard office. Description: Eastbound on the former W&LE in Oak Harbor.